The introduction of an in-house hydrostatic test facility at Rotork Singapore is making an important contribution to winning new contracts. One of the first orders is from Singapore-based marine, oil and gas consultancy Praj Marine (PMC) for a project in Africa. Rotork’s ability to provide third-party witnessed hydrostatic testing, combined with the supply of specialised failsafe actuation solutions on short lead times, have enabled PMC to secure new contracts for onshore wellhead and gas projects. 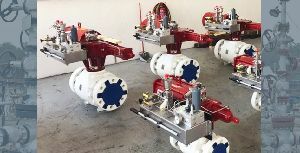 Specialised actuation is required because there is no power source available for valve control on the wellhead production flow line, water injection and disposal installations. Rotork’s successful and innovative solution comprises GH and RH hydraulic spring-return actuators operated by Pressure Safe self-contained manually operated hydraulic power packs. A hydraulic hand pump on the compact Pressure Safe power pack is used to energise the actuator and compress the failsafe spring, holding the valve in the desired open or closed position until a failsafe signal is received, at which point the spring will immediately drive the valve to the safe position. Failsafe operation of Pressure Safe units can be triggered by electrical signals, high or low pressure pilots or fire sensors, enabling the reliable fulfilment of many ESD (Emergency Shutdown) and pressure related protection duties in the oil, gas, petrochemical and pipeline industries. The order included mounting the actuators on 75 mm (3") and 150 mm (6") Class 1500 flanged ball valves. Find out more about Rotork's Self-contained Hydraulics.